Toddler tantrums are a part of every child’s life. Why? Because the logical part (aka the frontal cortex) of a human’s brain doesn’t fully develop until age 25. Woah, right? It makes total sense that toddler tantrums occur over completely illogical things and ideas. That part of their brain doesn’t actually work yet! No wonder yelling at kids doesn’t actually help cut down on tantrums. My toddler gets upset (raging mad) when I won’t let him eat a cookie before dinner. He gets super angry with me when I won’t allow him to pretend drive the car in the parking lot before we leave the house. post contains affiliate link, see my disclosure here. This has been going on for a year and a half. The kid adores cars and trucks and he desperately wants to drive a car. While I can’t seem to get rid of his undying urge to drive a car or eat cookies immediately before supper, I have found ways to quell the emotional extremes–the fall on the floor tantrums. We’ve helped tame temper tantrums and minimize toddler tantrums to more of a protest rather than a full-blown meltdown (mostly). Diversion is not the focus of these methods. In some situations, diversion is an amazing and perfect parenting strategy. But during a tantrum, the strategies listed below yield better results. Imagine, for example, you are in the midst of a good ugly cry (been there!). You call your mom or best friend, sobbing about how Target’s Dollar Spot totally robbed you–again. How would you feel if your best friend put a shiny piece of jewelry or a brownie in front of you and then changed the subject to what she was doing that weekend? To be honest, this might make you feel better for a brief moment, but it doesn’t really help you process and manage your anguish over Target’s Dollar Spot. How to deal with toddler tantrums. 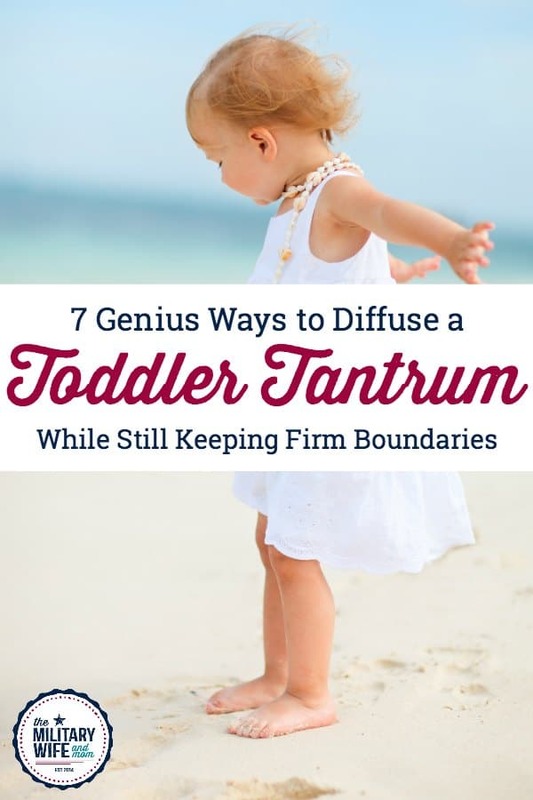 Let’s talk 7 real strategies for toddler tantrums that don’t involve sleeping and eating. Parents and caregivers are smart. If you are reading this post, I know you’ve already thought of that. The goal of these mesmerizing glittery bottles is to help your child pause for a moment. To allow the emotional part of the brain, which is fiercely raging, to take a break for a few minutes. Once your child is calm, help him or her process and manage the emotion using #7 below. When emotions are disorganized, a strong hug with your arms wrapped snugly around the trunk and shoulders provides powerful sensory input. The use of physical touch helps ground your child, restoring feelings of calm and control. Laughter encourages the intake of oxygen-rich air and increases the endorphins that are released by your brain. Laughter also revs up and then slows down your body’s stress response, resulting in a happy, relaxed state of mind. 4. Set the stage. Create expectations. Toddlers are far more cooperative with they know what to expect ahead of time. This is why consistent routines work wonders with toddlers. To set expectations give your toddler a 10 minute warning and then a 5 minute warning before a transition. In 10 minutes we are going to sit at the table and eat supper. In 5 minutes we are going to sit at the table and eat supper. It’s time to sit at the table and eat supper. 5. Give a drink of water. Giving a drink is an alternative to the calm down jar. This helps your child pause and focus on the drink for a moment. The goal isn’t to distract and divert, but rather to pause. After your child is able to calm down, help your child process and manage the emotion by giving #7 a try. 7. Reflect the emotion back. My favorite parenting hack of all time is empathy because it works! It’s an excellent way to get better toddler behavior. More than anything, toddlers want to feel heard. To feel validated. To feel like their emotions matter. The real deal with toddler tantrums. I could go on for days about the car drama I experience daily with my toddler. Just today he collapsed onto the asphalt of the parking lot over not driving. He wanted to pretend drive the car. He didn’t care that his baby sister was crying and hungry. He didn’t care that it was raining. He didn’t care that we were running late and didn’t have time. It was time for an toddler tantrum hack. This did not stop the meltdown entirely. BUT it diffused the meltdown enough that I could at least get him into the car seat with some cooperation. Target Dollar Spot…here we come. Tantrums is really stressful and depressing. Nice informative blog u have here. Hi Lauren, very helpful article. Me personally when my kid is emotional about something I try to do something funny to distract him from emotional moment. Can you help me understand the call down jar? What exactly do you do with the jar? Do you fill it with marbles or coins? Maybe write and put some ideas & tips of what to do when you’re needing to calm down? My 3-year-old daughter has always had and still has tantrum episodes every single day. It’s humiliating. Bedtime is so stressful EVERY DAY! And this is not the only time she is out of control. I have tried it all; routine, stories, positive reinforcement, games, etc., still, nothing works. We can’t figure it out…we would appreciate your input… I’m all ears!!! Thanks!!! My baby is already 6 years old, but I can remember tantrum horror like it was yesterday. I had some advice from my mother; my favorite was time-outs… sparingly. Depending on the child, using a time-out occasionally, beginning at about the age of 18 months especially intense and other techniques aren’t working. Placing your child in a quiet, or –better yet– boring spot for a brief period (about one minute per year of his age) can be a good lesson in self-soothing. Also, there are lessons online on how to talk with your toddler correctly. Most of them are rubbish, but few are gold. I found this one https://bit.ly/2BM1ZBL helpful.